The beginning of episode 4 is focused on Bruce’s main dilemma, Ra’s al Ghul’s dagger – the very one that Ra’s himself said is "the key to everything" before smooching with Barbara at the end of episode 3. Bruce and Alfred take the blade to a historian/authenticator/old white guy to learn more about the embalming knife of the first century Mesopotamian King Belahsi (try saying that 5 times fast). We will come to find out that the person Bruce went to for information about the dagger is Dr. Winthrop - the curator of antiquities at the museum. Bruce is determined to find out what is so important about the knife and why Ra’s wants it so desperately. The giant bat computer we all know and love from the '90s Batman animated classic does not currently exist in the Gotham world to analyze everything for Bruce, so it seems like he needs Dr. Winthrop - and his grandson Alex’s - help. Winthrop lets Bruce know that he will have to keep the knife overnight to study it more - immediately a red flag goes up in my mind, but Bruce allows him to hold onto the knife overnight. That evening Dr. Winthrop is able to decipher the message on the dagger which is a very ominous tale about the Demon’s Head and the prophecy of the destruction he will bring in his wake. 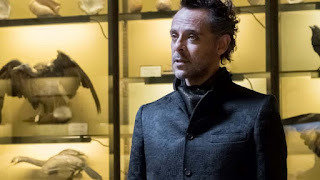 Dr. Winthrop explains the legend to his grandson as we see Ra’s al Ghul walking through the museum towards the examination room where he slowly knocks on the door. Winthrop, sensing danger, tells Alex to take the knife to his office. Ra’s enters the room and demands the knife that Bruce brought Dr. Winthrop earlier that day. It is unclear how Ra’s knew Bruce went there and left the dagger, but he’s Ra’s al Ghul – I’d chalk it up to many many years of experience. The alarm sounds alerting the police of the intruder so Ra’s kills Winthrop and leaves. He never finds Alex and the knife. The show takes a little break from this story arc to give us a snippet into what Nigma is going through. He is still struggling getting his groove back and is struggling to come up with the perfect plan/riddle. As he stabs a newspaper clipping of Cobblepot he proclaims that Cobblepot will be dead by tomorrow night. Back at the museum, Jim is called in to investigate the murder. Shortly after Jim gets there, Bruce comes to meet Winthrop and is stopped by an officer at the door to the room, right before entering the crime scene. Jim tells the officer to let Bruce in and Bruce immediately sees the body of Dr. Winthrop. I know Gotham is not your run-of-the-mill city, but I still feel like granting permission for a teenage boy to enter a crime scene with a dead body front and center is probably against GCPD protocol. Bruce lets Jim know that he dropped off an auction item to get examined and he was coming to check on the progress. He also tells Jim about Winthrop’s grandson Alex and that Barbara was also aggressively bidding for the item at the auction. 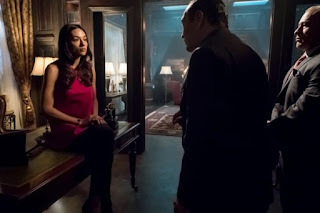 Sophia Falcone goes to meet with Cobblepot who is clearly unhappy that Sophia is in the city because of his history with her father. 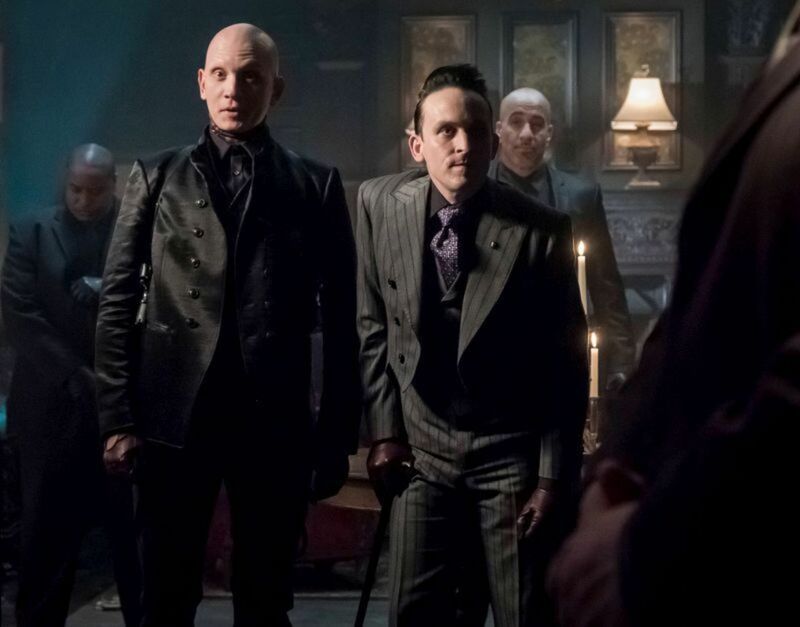 Cobblepot makes it clear that he needs to know that Sophia is not in Gotham for the wrong reasons, or Zsasz will deal with her. Zsasz has some hilarious quick one liners throughout the episode and he is quickly becoming one of my favorites. Sophia tells Cobblepot she just wanted to come back to Gotham because Gotham is home. Cobblepot pretends to believe her story when in fact he is actually using her as bait to trick Falcone’s old allies out of hiding. Much to Zsasz’s delight, the plan works like a charm. Jim goes to see his old sweetheart Barbara to inquire about the dagger. He wants to know who is bankrolling her, and just as she denies Jim the name – Bruce storms in asking if it’s Ra’s al Ghul. Barbara claims she doesn't have any knowledge of Ra’s so Jim takes Bruce outside to find out more information. Bruce lets him know that Ra’s is the leader of the court of owls and a very dangerous man. Jim realizes he needs Bruce’s help to find Alex and Bruce quickly figures out where he is. In the meantime, Ra’s has enlisted the help of a couple of interesting... guests... to aid in retrieving the dagger. One seems to be a man-dog hybrid named Anubis – the other, let’s just call him the large, silent type. Bruce and Jim are successful in finding Alex, but Anubis has followed the scent there as well and interrupts the conversation. They all manage to escape although Bruce and Alex find themselves separated from Jim. Alex decides to take Bruce to where he hid the knife while Jim heads back to the precinct where Ra’s himself comes to talk with him. Ra’s pretends to be on government business from Nanda Parbat, a nation in the Himalayas. He is claiming that the dagger is of historical significance to his country. Alfred rudely interrupts the meeting and Ra’s disappears to continue his pursuit of Bruce and Alex. Twice during the episode we get fantastic scenes of Nigma sending two men to rap a message to Cobblepot, which include the locations of where to meet him. The first one Cobblepot solves, but Nigma never shows up (although he claims that Cobblepot is the one who didn’t). The second riddle was so terrible that Cobblepot has no idea what the answer could be. Nigma barges into the Iceberg Lounge to find Cobblepot. Cobblepot realizes that Nigma is no longer the Riddler, just plain old Ed Nigma. Cobblepot had set up a trap with Fries waiting to put Nigma back in ice. In a last ditch effort, Nigma admits he is not the Riddler anymore, causing Cobblepot to have a change of heart. Cobblepot realizes that a far worse revenge would be for him to let Nigma live as the simpleton he has become. The banter between these two characters has always been a highlight of the show for me, and I envision many such confrontations in the future. Ra’s men track down Bruce and Alex at the museum where he hid the knife. A fight ensues and luckily Jim gets there right in time to save the day. He disposes of both of Ra’s men, and demands to know the truth from Bruce about the dagger. Just then, Ra’s appears and puts a completely unrelated and much less special knife to Alex’s throat. He threatens to kill Alex if they don’t turn over the dagger. Jim demands that Bruce give it to him, but Bruce refuses to hand it over. Bruce tells Jim about the magical healing waters and Alfred being treated by them after he died. Ra’s has heard enough and slits Alex’s throat. Jim arrests Ra’s and as Jim is having a hot and heavy evening with Sophia – Ra’s is being taken to prison... with a big smile on his face. In next week’s episode it looks like Bruce has decided to really take matters into his own hands and kill Ra’s al Ghul with the dagger. Alfred goes to Jim for help trying to stop Bruce from taking on Ra’s alone. Of course it looks like Bruce’s plan seems to backfire, but we’ll have to wait until next week to see the extent of the damage!